A multidisciplinary team of scientists from Spanish universities and research centres, among which is the University of Valencia, has managed to design small synthetic molecules capable of joining to the genetic material of the AIDS virus and blocking its replication. This achievement has been obtained for the first time in the world by a group of researcher led by José Gallego from Universidad Católica de Valencia "San Vicente Mártir". The University of Valencia, the Príncipe Felipe Research Centre, and the Instituto de Salud Carlos III have participated. The work has been recently published by Angewandte Chemie International Edition, one of the most prestigious scientific journals in the world in the area of Chemistry. The newly designed synthetic molecules inhibit the output of genetic material of the virus from the infected cell nucleus to the cytoplasm, thus the virus replication is blocked and avoids the infection of other cells. The genetic material of the AIDS virus, or HIV-1, is formed by ribonucleic acid (RNA), and encodes several proteins that allow it to penetrate the human cells and reproduce within them. The new virus inhibitors, called terphenyls, developed by this group of scientists, were designed by computer to reproduce the interactions of one of the proteins encoded by the virus, the viral protein Rev. In this way, the terphenyls join Rev's receptor in the viral RNA, preventing the interaction between the protein and its RNA receptor. This interaction is necessary for the virus genetic material to leave the infected cell nucleus and, thus, it is essential for the survival of HIV-1. The fact that the terphenyls block the virus genetic material output of the cell prevents the infection of other cells. This discovery is the result of a close collaboration between three research groups throughout several years. Thus, the scientists of the Universitat Católica de Valencia were in charge of the computational design and verified experimentally that the terphenyls were capable of joining the Rev receptor in the viral RNA and inhibit the interaction between this RNA and the protein. For its part, the molecules were synthesised in professor Santos Fustero's organic Chemistry laboratory in the Príncipe Felipe Research Centre and the University of Valencia. 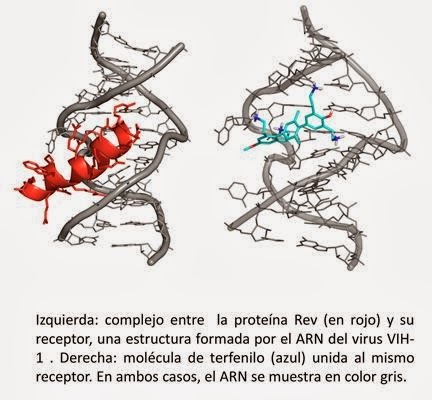 Also, through experiments with cells infected by the virus, the group of José Alcamí in the Instituto de Salud Carlos III demonstrated that the inhibitors block the replication of the HIV-1 and inhibit the function of the Rev protein, confirming this way the validity of the models generated by computer. Traditionally, pharmaceutical companies have focused on the development of medicines that act on target proteins, as the approach to the receptors made out of RNA is considerably complex. Although several natural antibiotics act at the bacterial ribosomal RNA level, up to now designing by computer a new synthetic chemical entity capable of joining RNA target and have a relevant pharmacological effect was not possible. The terphenyl structures identified in this research could open new ways to approach other therapeutic targets formed by nucleic acids. On the other hand, the infection by HIV affected 34 million people worldwide in 2010, according to the World Health Organisation (WHO). The emergence of resistance to the current antiretroviral therapies and the lack of an effective vaccine highlight the necessity of identifying the new medicines that act on other virus targets. Rev protein constitutes one of this alternative targets, but so far they it has not been possible to develop antiviral agents based in their inhibition. The results of this research have been the objectives of a patent application, and the three laboratories involved in the research keep their collaboration with the objective of improving the pharmacological properties of new Rev inhibitors. This work has been published as a 'hot paper' or particularly interesting article in Angewandte Chemie International Edition, one of the most prestigious scientific journals in the world in the area of Chemistry. After a very positive evaluation by anonymous reviewers, these articles are selected by the editors of this journal according to their relevance in a high interest, rapidly evolving field. The results of the article have been summarised in one of the cover pictures of the journal.